Birmingham - (23 January 2001) - The XFL has been telling us that they will make our football experience better than the way we were accustomed. This was suppose to make us forget the NFL. It's working. Marketing of the league has been ongoing since the XFL was first announced. The latest marketing scheme we heard of was that of an airplane that has been hired to tow a XFL/SPALDING banner over the Superbowl game this Sunday. The marketing effort is peaking. But now it is time for the show. 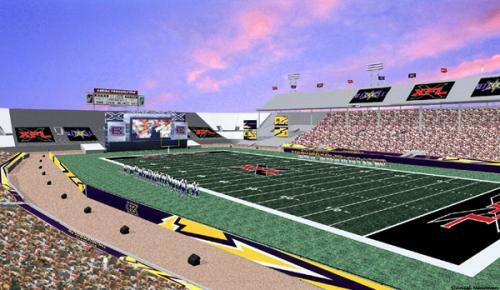 To create an special atmosphere the XFL has been telling us that they plan renovations to some of the XFL's stadiums. Changes to Legion Field in Birmingham are happening right now. It was reported that there are a total of three truckloads of equipment being assembled on Tuesday afternoon alone. On one end of the stadium is a 3-4 story high scaffolding with an elevated platform which will be viewable from every seat in the stadium. The scaffolding has a hollow center so as to house a screen. It is very similar to something you would see at a WWF event, but much bigger. The stadium will also be done up in advertising promoting sponsors and the XFL. Team colors are also used throughout the stadium.